In my worldbuilding project, 2 continents located on roughly the same latitude are connected by a land bridge. Both sides of the bridge are surrounded by a temperate grassland, and the lack of seasons means the climate is steady year round, so that rules out winter as an option. The sentient aliens in my world, which I've been calling Not Humans, (very original) evolved on Continent A, and eventually spread out to Continent B across the land bridge where they found a species that wasn't present on Continent A. (Comparable in function to a horse) I haven't decided what the terrain is like on the bridge, but I would like to keep both sides of the bridge as grasslands if possible. Why would these animals exist on only one side of the land bridge rather than both? One obvious answer is that the land bridge itself lacks food. Nothumans can cross the Bridge because they're smart and pack a lunch. Nothorses can't cross the Bridge because that region lacks fodder for the grass loving megafauna of Continent A to venture through. Another possibility is utterly ungothroughsome territory. If the Bridge is very low lying & swampy, nothorses won't be able to get through because they'll become mired. Nothumans can pick a path where others fear to tread or can build boats or swampshoes to traverse the Bridge. Many land bridges are often covered by tides, making them only passable at certain times. As the tide comes in, the bridge is covered, it is uncovered again once the tide goes back out. Perhaps your Nothorses are not smart enough to wait until the tides start to head out before quickly crossing. Your Nothumans on the other hand are smart enough to know when to wait and when to go. There is nothing physically stopping the nothorses from crossing (allowing them to be brought back to the Nothuamn’s continent), its just they are not smart enough to work out when they should cross. If timed wrong, the tides would come in and sweep either Nothorses or Nothumans out to sea. 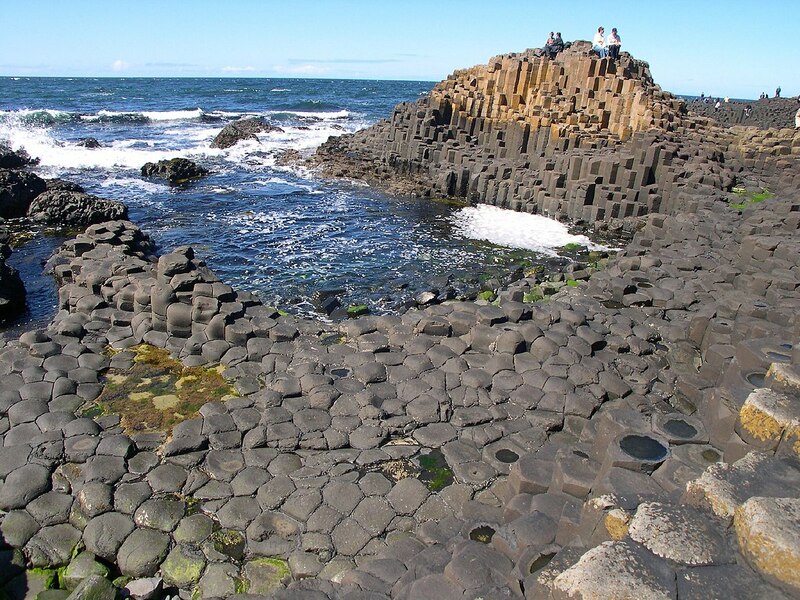 This was a land bridge that stretched from Ireland to Scotland, its really interesting to look at with all the natural hexagonal rock formations. Not only is it interesting to look at, you’d have a hard time trying to get Nothorses to walk over that. You could pull them across, of course, but i doubt they’d want to walk over it if they didn’t have to, given how uneven and unforgiving the terrain is, especially for a creature of their size. As others have posited, perhaps the land bridge is particularly difficult for nothorses to traverse. Horses are pretty well adapted to open, rolling steppe. It wouldn't actually take that much of a change to make it unlikely for them to make the crossing. Lack of water, swampy territory, heavy woodland, presence of poisonous plants that they're not adapted to (ragwort in real life is deadly to horses), lack of grazing, too much grazing (one of the issues horses have outside of the steppe is the high sugar content of lush European grass, which causes health issues). Any of these, perhaps dialled up a bit, would do well to restrict their range. In addition to the other answers about physical land barriers or poisonous flora, predation could also work. Continent A has something that thinks nothorses are extremely tasty. The small numbers of nothorses that make it across the bridge do not survive long enough to establish a stable population. It gets worse for nothorses when their nemesis makes the jump in the other direction, but at least they have a sizeable population already present so they can maintain their numbers more easily while they adapt (or don't, of course). For a real-world example, you can look at the restrictions to the range of platypodes in Australia. Their range is curtailed to the West of the continent by the larger presence of crocodiles in the East. There are two main ways land-bridges are commonly formed. The first is a collision of two landmasses due to continental drift. This tends to be relatively permanent on a biological timescale. The second is land beneath the waves that is exposed by falling sea levels, which tends to be more transitory. Perhaps your land bridge is of the latter type, and has only recently become traversible (say, in the past couple of thousand years). It takes time for population pressures to develop and push an animal to expand their current range. Nothumans, like their human counterparts, are curious. They seem to like exploring. It's likely that they will make the journey across to find new, untapped resources. Nothorses, however, are not particularly adventurous. If they're anything like actual horses, 'not particularly adventurous' is a sizeable understatement. There isn't actually anything at all preventing nothorses from moving across the gap. They just haven't yet. The terrain of the land bridge is navigable by not-humans, but difficult or unpleasant to traverse by not-horses. Refer to cattle grids, a man-made structure used to allow humans (and vehicles) to traverse a passageway, but not livestock. Naturally-occurring, highly-uneven terrain between these two areas might sufficiently dissuade the not-horses from crossing, while still remaining traversable by the not-humans. The animals are particularly susceptible to radiation poisoning (causing sterility at low levels). The background radiation on the bridge is unusually high due to an large scale natural nuclear reactor that has been pushed to the surface with recent geologic uplift. The same explanation could apply to other naturally occurring toxins. Toxins could also take the form of a terrible smell, or sound, etc. that affects the animals but not other species. In short, during the Cold War, the fence/wall border between the East and West of Europe didn't just separate humans. It also kept the deer apart. Even though today there are no barriers to speak of between these countries and no deer alive today lived through the Cold war, the deer populations refuse to cross the (now imaginary) line. Taking this and applying it to your case, you could easily have the land bridge once populated with a predatory semi-aquatic species, which wouldn't venture too far inland. This could lead the horse species to avoid the landbridge, even if this predatory species is long gone. Some plant which exists on the other side, not very noticeable to humans but toxic to the horses. Or turn it around something they need in their diet. A reason which possibly doesn't exist anymore, like an extinct predator, but the horses learned to leave their home because of it, possibly using the magnetic field to judge where that is. No reason to expand. If the population of the horses is controlled by something other than the supply of food and space they might not have had any reason to move. ...I'll try to think of more later. Or whatever the term is under your latitudes (edit: cattle grids). In my native language, it designate a mountain bridge, with a fenced surface (so you can see through it). Cows are deathly afraid of the void and unless being forced, won't cross it. It has been designed to keep livestock in defined area, so it should fit the bill perfectly. Edit: Ruadhan pointed in the comment that livestock does not cross a cattle grid not because of the void, but because of the shape of the bridge, that would lead their hoove to slip between the bars (and potentially causing injury). I've found conflicting sources online and can't really tell you the main reason. Shape of the bridge is treated in the second option I propose. Note that it also could work with a rope bridge. Horses wouldn't be able to cross it while we have (almost) no problem using one. Edit: Given the way you have worded the question, I assume the bridge must be as natural as possible. Perhaphs one of the two suggestions above is the result of a specie of vine/climbing plant that somehow thrive above seawater and thus is prolific on your coast, to the point two points bonded over the years. Maybe this seawater vine eat fish. Or need high-concentration of salt/iode/whatever. Who knows? I can think of two realistic ways. the land bridge is very new, human will notice the change before anything else, it will take a great deal of time for animals to exploit it. Humans explore for exporations sake. the bridge is not so much a bridge as a chain of islands, human on canoe can jump from island to island with ease but other animals will have a much harder time, and the larger the animals are the longer it will take. Alergic Flora The animals could be allergic to a type of flora that thrives either along coastlines or along the specific geographical conditions of the land bridge (ex. high coastal winds, tides, salt, brine). This condition could surround both continents as well if the animals don't spend much time near the coast. Technological Advantage If the humanoids have primitive sailing technology, then perhaps the land bridge is impassable for all species, and the humanoids crossed by sailing along the coastline. Predators Perhaps there are particularly viscous predators that inhabit the land bridge or the waters nearby. The humanoids can use fire or other technology to fend off the predators, but the animals are largely helpless against them. Could be large birds like Rocs that nest in the cliffs or sea monsters. 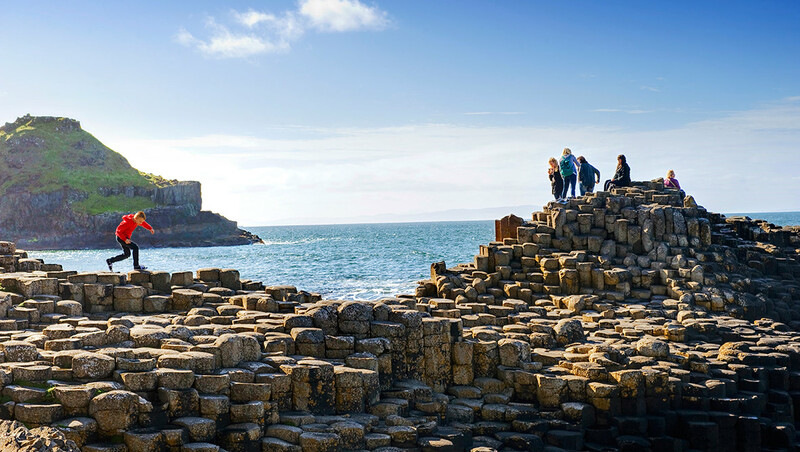 Essentially, your continents may have been separated in the past, but due to lowering tides have become connected via this land bridge in more recent history. Disclaimer: Someone more knowledgable may be able to expand on specific climate-related science to assist with Worldbuilding a cause for your Wallace Line. My answer addresses the effect of such a boundary. A massive trench divided these regions, preventing any natural formation of land bridges for the duration of that era. In short, this led to differences in the land animals that populated these landmasses. Your landbridge may have formed well after the evolution of your not-horses, and so they have evolved in one location but were not found on the former continent, initially, for this reason. If your not-horses are not unusally intelligent, as your not-humans would be, they are likely content with their familiar and robust territory. Address the differences in the organisms you are comparing, as you have created them, and you have any number of causes for behaviour stemming from these traits and characteristics! Humans as we know them are curious, while horses may be safe, coy or timid. Because the land bridge contains a terrain similar to a staircase. It is pretty easy to get a horse up a flight of stairs, but extremely difficult to coax them down a flight of steps. Horses are strong swimmers, so you'll want to make the land bridge long and you'll want very rough water in the area. You could also make it so there are bits of ocean to cross with a nasty current due to tidal forces - only between tides would it be relatively calm (but not actually calm). Maybe some marsh land on their side to keep the non-horses from even getting very close. Or even a slight slope that goes from high to low tide (in elevation) which means no vegetation (food) for a few hundred yards would keep them further from the land bridge. The area near the grasslands may be a "sink". There are horses there, but the birth-rate/survival rate is low, most of the population has come from somewhere else ("the source"), thus there is no pressure from a growing population to expand into new territories. The population would actually be extinct were it not for new individuals constantly moving in from more hospitable environments. Why is this area inhospitable? Perhaps the grass is very low in key nutrients that are necessary to carry a fetus to term or to nurse a young animal, so only a few animals make it to adulthood each year. Related point 1: the species may not be doing that great anywhere in their range. Any species with a net-zero population growth wont be expanding anywhere. 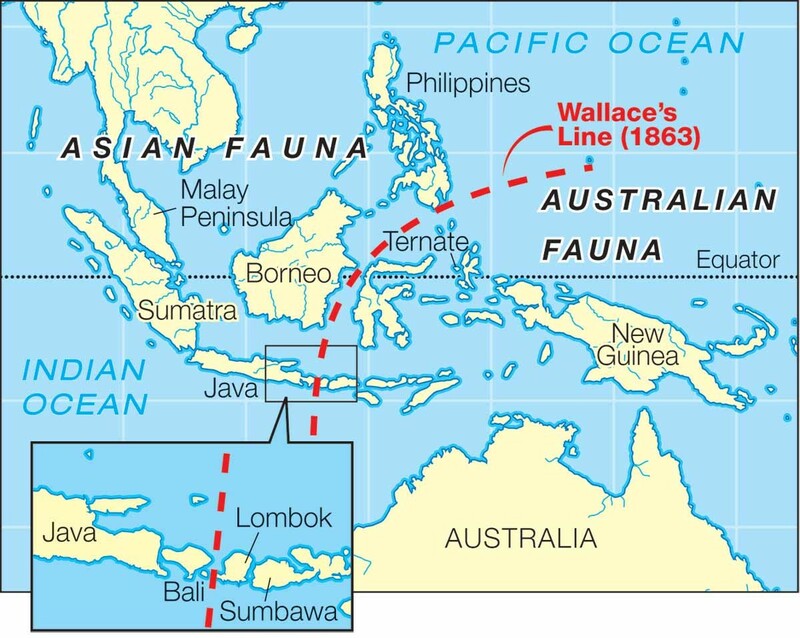 Related point 2: perhaps the land bridge is towards the extreme edge of their territory. Many animals migrate back to certain places to bear their young/find a mate (due to warmer temperatures, fewer predators, more food, safety in numbers etc.) and maybe this is as far as they can reasonably get to before having to head back to give birth etc. Bioindicator density: A complete lack of desirable bioindicators or a wealth of undesirable bioindicators will often cause fauna to either shun or congregate to certain areas previously unexplored. Some simple examples would be things like availability of food, certain densities of specific colors in flora that trigger unconscious fear responses, etc. Regional predation: It could be as simple as there is a species on the bridge and possibly the sentient's continent that for whatever reason also doesn't congregate beyond their continent as well as the land bridge itself; sort of an inverse relationship if you will. That species then feasts on most if not all animals it comes across. If the sentient biological make-up has something inherently inimical to these predators then they will have adapted to either avoid them, or their failed attempts at preying on the sentients simply make them a non-issue only for the sentients. It could also be that these creatures are trivial for the sentients to handle due to their availability of tools in offensive or defensive scenarios. Induced hydrophobia: the very sight of water could scare away some species in a specific region if dense with life that can infect other life and trigger hydrophobia. Just seeing the ocean could terrify all the animals from the other continent due to their infection or parasitism that triggers hydrophobia being ubiquitous for the region. Intolerable atmospheric pressure: the animals might not be able to handle high altitudes very well whereas the sentients have little to no issue with it. If your land bridge was sufficiently elevated, it could be inimical to many forms of life if they're sufficiently susceptible. Disruptive magnetoreception: there could be something very disruptive to the animals with the magnetic field around the land bridge that leads to that area being shunned or possibly even a death trap where creatures become disoriented when getting too close, causing fear/fleeing, or death by exposure/lack of necessary nutrition. My personal favorite is the last due to imagined long-term consequences. Can you picture such a sprawling graveyard after a couple million years? Maybe in some places it is a tunnel or a formation has formed over it that the nothorses can't fit through. Or possibly the sand is incredibly sticky to the nothorses feet and it's simply the shoes that the nothumans wear that allows them to cross without getting stuck. Or the fact that nothumans have arms that they could use to grab onto trees to unstuck their feet as they walk. In this same vein, the ground could be a temperature that the nothorses can't handle on their notshoed nothooves. Not the answer you're looking for? Browse other questions tagged science-based biology xenobiology fauna travel or ask your own question. What reasons could there be for cement not setting? What is the best body plan to allow for giant size in a terrestrial animal? What would be evolutionary reasons for a humanoid species to develop multiple arms?